As I was scribbling down my to do list at work yesterday, feeling freakishly happy and content while doing so, I again realized how much I love making lists. And seeing that my New Year's Resolution is to "do what you love, and do it often", I thought; why not make a weekly list on my blog? 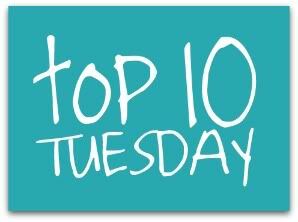 So, ladies and gentlemen, I present to you... drum roll please... Top 10 Tuesdays! 1. Google - How on earth did we ever survive before Google!? No, really! How!? 2. Facebook - I sincerely thank Mark Zuckerberg for this amazing site. I live abroad, and if there was no Facebook, I would have to write about twenty emails to friends and family everyday, just to make sure they don't forget about me. 4. YouTube - Where else can you watch a video compilation of people falling out of boats? 5. Pinterest - A recent favorite of mine. Totally addicted to "pinning". 6. Twitter - Yes, I tweet. 7. Agoda - Any traveler worth his salt would know this website. It has THE BEST deals on hotels. 8. Gmail - Since I can remember, I've used Gmail and have never had any problems. It's free and you basically never have to delete anything... ever... for the rest of your life! 9. Wikipedia - Gone are the days of pouring over old, dusty encyclopedias in a library, for hours, searching for information. 10. Skype - I remember the first time I Skyped. It blew my mind! It still does. I hope you enjoyed my first Top 10 Tuesday list. Do you have a favorite website that's not on my list? Please share it with us! I liked Facebook more when it was simple and it wasn't taking over the Internet. There are hardly any websites that you can go to without being asked to "like" something on Facebook or "share" it. I'm following you on Twitter now (RobinOrchid). Yeah, I also don't really care much for all that other jazz, as long as I can message friends and family, and look at photos. Thanks for the Twitter follow! Have a lovely day! Couldn't agree more about Google and I guess the internet in general. How did we find out stuff? I would have to add hulu and Netflix to your list since I like tv shows and movies so much. I know exactly what you mean! I couldn't live this far away from my family without it. I ran across your blog today and love it! I get caught in that Youtube "domino effect" where I'll look up something informational and before I know it I'm looking for videos of some random 80's star from before they were famous. Eesh.